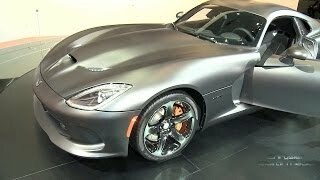 Chrysler Group’s SRT (Street and Racing Technology) has announced plans to introduce the Viper GTS Anodized Carbon Special Edition at the 2013 Los Angeles Auto Show. 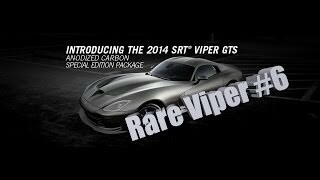 The special edition will be limited to 50 units and pricing will be announced at debut. On the exterior the special edition package has an exclusive metallic matte exterior color with Black Vapor Chrome five-spoke “Rattler” wheels, Gloss Black GTS badge, Satin Black exhaust bezel, Anodized Carbon fuel filler door, orange brake calipers, carbon fiber brake ducts and rear applique. Luxurious interior accents are achieved through elegantly appointed Nappa leather and Alcantara upholstery. 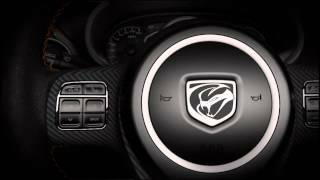 Carbon fiber accents are added throughout the center stack, door panels and steering wheel, and an exclusive carbon GTS badge adorns the dashboard. 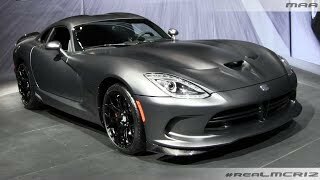 The 2014 SRT Viper GTS Anodized Carbon Special Edition will be powered by the all-aluminum 8.4-liter, mid-front V-10 overhead-valve engine that produces 640 bhp (477 kW) and 600 lb-ft (814 Nm) of torque, the most torque of any naturally aspirated sports-car engine in the world.